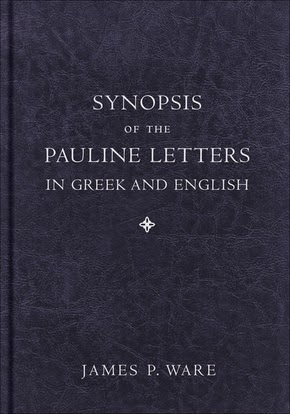 J.P. Ware, Synopsis of the Pauline Letters in Greek and English (Grand Rapids: Baker, 2010). This is not exactly a book review, just a blog post to say that I have found this book much more useful than I originally thought it would be when I got it a couple of years ago. I confess that when I first got a copy of this book I wasn't really convinced that it was going to be that helpful; but I have found myself turning to it very often in the last year or so. So the other day I was reading 1 Thess 1.1 (as one does); and I noticed that in NA28 the full version of the 'grace and peace to you', i.e. the following bit 'from God our father and the Lord Jesus Christ' is noted in the apparatus with the reference (2Th 1,2). I thought to myself (as one does), 'surely that addition doesn't come from 2 Thess 1.2 specifically, but from the fairly common usage throughout Paul's letters'. So I picked up the Synopsis and confirmed my suspicions - there is no particular reason for thinking of this as a scribal harmonisation to 2 Thess 1.2, once could as easily have said Rom 1.7; 1 Cor 1.3; 2 Cor 1.2; Eph 1.2; Phil 1.2 or Philm 3. Then when I was reading 1 Thess 1.2 I noticed the NA text lacks UMWN. I thought to myself, 'well that is probably a harmonisation to Pauline usage elsewhere too, despite there being no hint in the apparatus'. Since the Synopsis was already there on my desk I checked and found the parallels(with UMWN) in Rom 1.9. These two examples have to do with thinking through harmonisation type variants, but the book is more useful for finding parallel content in Pauline letters in the study of Paul's thought. E.g. 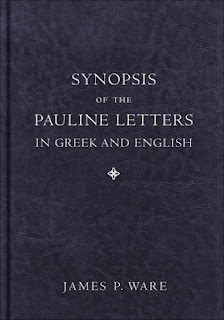 all the greetings sections of Paul's letters, or all the times Tichycus appears, or all the signatures, or all the times Paul discusses a topic or theme. I like the fact that the texts are given in Greek and English (in diglot format) - quick access with details here. I like that there is a critical apparatus to the Greek text. I like the fact that every bit of all thirteen letters is printed (and that some passages are printed many times in connection with each of the major themes). I also like that fact that relevant passages from Paul's preaching or activity in Acts are also included. I like the fact (once I got used to it) that the index comes at the start of the book. I like the fact that by and large interpretive and critical judgements don't intrude on the usefulness of the book. A couple of design compromises should be mentioned: firstly, although it is called a Synopsis, the texts are not actually laid out synoptically (thinking of something like Aland's Synopsis), so wording parallels (or differences) don't leap out at the reader. Associated with that is that there is not much blank space. This book is more for reference than for colouring, underlining, note taking, and all the other fun things you can do with a gospel synopsis. A.J. Forte, 'Observations on the 28th Revised Edition of Nestle-Aland's Novum Testamentum Graece' Biblica 94 (2013), 268-292. This is an interesting review or set of observations about the NA28, largely positive, and full of information. Among other points, he does suggest that the basis of the new parts of the text on the so-called coherence based genealogical method should have been explained better within the edition. He discusses James 1.20; 1 John 3.7 and Jude 5, comparing the text and apparatus of NA27 with that of NA28. This is a frustrating operation since there is nothing in the evidence cited in the apparatus which would explain the changes, it is all about a different method and a different way to evaluate witnesses: 'The textual choices of the editors can only be understood in light of the Coherence-Based Genealogical Method.' (p. 276) Indeed he suggests that the apparatus should include the abbreviation TP (for Transcriptional Probability) 'to indicate those instances where the lectio difficilior, although supported by fewer witnesses, is probably the original reading' (p. 278 n 15). He shows how the fuller apparatus of the NA28 is generally much more easily understood than the more compact apparatus of NA27. This expansion comes at a cost though, in a hundred more pages (p. 282), and a much higher proportion of each page given over to the apparatus and less to the actual text (I have noticed this a lot recently). Aside from a couple well-attested diacritical marks (the trema and apostrophe), lectional signs and punctuation are not common in Greek documentary papyri. Where they do occur, however, they can be as instructive about scribal practice and training as the better-known benchmarks of, e.g., palaeography, orthography, and grammar. They can, in short, tell us something about the habits and education of scribes. My aim in this paper is to investigate scribal behaviour by examining the types of lectional signs and punctuation marks (accents, middots, etc.) employed in a variety of types of documents, from private letters to petitions to receipts. I will consider factors that might have dictated their use in specific cases, such as the perceived need for formality on the writer’s part or the desire to avoid ambiguity. Furthermore, I will evaluate, to the extent allowed by the evidence, the broader historical and cultural contexts of the documents, including the archives to which they belong, the archaeological sites that produced them, and the periods in which they were composed. The village of Dime in the Fayyum has yielded a great number of literary and documentary papyri dating from Roman times, both in Egyptian and Greek. The texts written in Egyptian come mostly from the temple of Soknopaios, the main temple of the village. Thus, scribal practice can be studied at different levels: in the comparison and the relationship between literary and administrative texts written by the same scribes; in the question of professionalism through the redaction of contracts, for which one can witness a certain continuity with the Late Ptolemaic period; in the persistence of scribal practice in Demotic for the internal administration of the main temple of the village (receipts, agreements and accounts). My paper will focus mainly on this last point by studying the way internal administrative papers and records were written and kept in the temple of Soknopaios. It will deal with the material aspect of writing (use and reuse of papyrus, handwritings, marks of control, costs of writing) to observe priestly scribes at work within the temple from the 1st to the 3rd century AD. The use of abbreviations is a common phenomenon in administrative and official documents (either those written by the administration, or destined for official eyes). This is too easily dismissed as the unremarkable result of random variation: a closer look at the evidence suggests that both the use and the form of abbreviation may be highly revealing, varying between classes of words (common administrative formulae or more informationally dense personal details), the physical environment in which the word occurs (line initial, medial or final) and in the type of abbreviation used (e.g. raised final letter, supralinear stroke). The case of duplicate documents is particularly revealing, providing not only a corpus within which the abbreviational tendencies of individual scribes can be observed, but sources within which the scribe’s consistent or inconsistent treatment of identical words in identical texts is clearly visible, highlighting professional or individual scribal preferences, and the ways in which abbreviations contrary to these preferences may originate in earlier iterations of the document. The latter tendency may help us to discern the priority of duplicates. As test cases for this approach, we will examine a range of document types which cover a wide temporal and geographic range, and which contain both highly standardised formulae and extremely open-ended information specific to each declarant. In the first century after the Islamic conquest of Egypt in 641 AD, the country underwent major administrative changes. For the first time, administrative texts were written in Coptic and many of these involve taxes, especially the religious poll tax introduced by the new rulers. One striking aspect of this change is seen in the similarities witnessed in Coptic scribal practice in the corpus of bilingual Coptic-Greek tax documents written between the 690s and 720s in the area from Hermopolis to Hermonthis. This paper will examine the formulaic and palaeographic similarities found in one particular group of texts—tax demands issued from the office of Arabic officials—in order to examine the role of Coptic scribes in the administration during this period. A current research project (Austrian Science Fund/FWF project P24649-G15) is dedicated to the question of translational tendencies and mistakes in two early translations of the Gospel of John: The Latin and the Coptic version. The paper will focus on selected Sahidic manuscripts in order to address the following questions: Is it possible to deduct from the evidence of the manuscripts which training the scribes had? Is it further possible to come to a conclusion as to the actual act of copying? The question would be whether this was the task of one scribe comparing his work to the manuscript that was copied or whether it was the task of two people: In this case one would read the manuscript to be copied aloud and the other would write his copy from this dictation. These two questions will be addressed, focussing mainly on statistical factors of allographs of carefully chosen words from selected manuscripts. It is obvious that the ability to act as a scribe for a dictated text presupposes a different training from the act of copying a text visually. During the Middle Ages, through all parts of the Mediterranean area, numerous monasteries were renown for their scribal activity. In these monasteries, scribes transmitted in Greek language numerous corpus of all works – literary, scientific, religious – especially the texts of the New Testament. Monasteries of Southern Italy remain today the place where were copied a special group of Greek New Testament manuscripts, known as “Family 13”. All these manuscripts – about a dozen – were copied in the same area, mostly Calabria, between the 10th and the 13th centuries AD. On one hand, they present a similar scribal practice, especially on palaeographical grounds. On the other hand, they are considered by biblical scholars as a first order witness of the Greek New Testament: that means that this group is always quoted in all critical editions. According to textual critics, the readings of these manuscripts are highly valuable because they agree with a text used by Origen in the middle of the 3rd century AD, in Caesarea Palaestina, a thousand kilometers away from Southern Italy. On the basis of observable phenomena, this paper will emphasize the two sides of scribal knowledge transfer: the physical practice of writing and the evidence of the text tradition. After a short presentation of the documents, we will first consider the daily scribal activity, including the process of writing and the daily use of these manuscripts. We will then focus on the preservation process of a singular textual tradition: How very ancient readings used during the third century by the first Christian communities were still in use in Southern Italy centuries after? Considered as Christian artefacts, manuscripts reveal quantitative data about knowledge transfer across centuries. The case of the Family 13 manuscripts is an interesting example of the role of scribes in pre-modern societies. 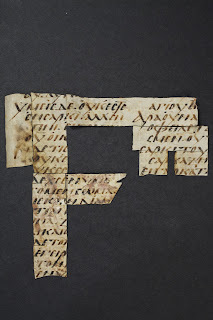 In this paper I investigate the role of scribes in Greek private papyrus letters. When an individual decided to write a letter, he had two options: writing the letter himself or paying a scribe and having the letter written. Many papyrus letters were the result of the work of a scribe. Outsourcing the task of writing was the only possibility when one was illiterate. But when the sender could write and read, he could pen the letter himself. The first research question in this study is whether the choice to use a scribe or not can be considered a conscious decision. In P.Mich. VIII 469, preserved in the archive of Claudius Tiberianus, the decision not to hire a scribe seems to be taken deliberately: the fact that the letter was written by the sender himself, bears in itself a message to the addressee. The second and main query is whether the intervention of a scribe has an effect on the language used in the letters. At first sight, the influence of the scribe seems rather limited. However, the investigation of letters preserved in archives can shed more light on this matter: in different case studies, I compare the language of one single sender in autographical letters and in letters written by a scribe. The archive of Asklepiades shows the effect scribes can have on the epistolary language: in the letters from Isidora to her brother Asklepiades there is a marked linguistic difference between the autographs and the letters she dictated to a scribe. In other collections of texts, such as the letters from Eudaimonis in the archive of Apollonios strategos, there is no such difference: the personality of the sender is apparent in all letters, autograph or dictated. This paper has a double conclusion: firstly, we observe that letter writers make deliberate choices when writing letters: these choices are situated at the level of using a scribe or not, and at a linguistic level. Of course, these findings cannot be generalized, but this paper provides nevertheless an important insight: although the authors of documentary letters cannot be compared to authors of literary works, we should not underestimate the creative capacities of the senders of papyrus letters. Secondly, the influence of scribes on the language of the papyrus letters is rather limited. Mostly, the scribes just penned down what the sender dictated. The language of the papyrus letters can thus safely be assumed to be the language of the letter writer. The ongoing publication of the fourth century Aramaic ostraca that have surfaced from the region of southern Levant is incredibly important for understanding socio-economic processes and conditions in the western provincial regions of the Persian empire. The study presented here will be subject to the final publication of the remaining ostraca, but hopes to probe and test methodologies that could be applied to the corpus in understanding the function of its individual pieces. Since the initial publication of the Aramaic ostraca, their function has remained an important and contended issue. For the most part, the Aramaic ostraca are inscribed sherds of pottery that appear to detail, in short-formulaic phrases, the movement and quantities of commodities. Some of the ostraca bear markings that appear in enlarged script and easily distinguishable forms usually positioned at the end of the body of the text and occasionally alongside a signatory. It is a widely held view that ostraca found in Greece, Egypt, and the Levant functioned as drafts or scrap paper of a scribal bureaucracy. However, the scribal markings in these ostraca have been used to support the suggestion that the ostraca had a wider circulation beyond that of being drafts for papyri record lists. This paper presents a detailed analysis of the scribal markings published thus far. It tracks the physical characteristics of the markings, aspects of scribal identity and the syntactic features of the ostraca, probing possible explanations for their function. The activities of scribes in original documents highlight their own cultural and ethnic backgrounds. By this, an identification is possible of members of this important group of social actors, in my case: the personnel of early Islamic chanceries, that are otherwise elusive in the literary sources. Their traces in the documents serve as a basis for a prosopography of these largely anonymous scribes. The following phenomena are useful for my analysis: (a) palaeography and layout; (b) phraseology and style; (c) grammar and orthography. Of peculiar importance for the analysis is the multilingual character of early Islamic chanceries with their parallel production of official documents in Arabic, Coptic, and Greek in the western parts of the caliphal empire and Iranian languages in the East. In my paper, I will present a ‘mapping’ of chancery scribes in Egypt after the Muslim conquest. This will be held against two major developments: the successive Arabisation of the chanceries in the wake of reforms initiated by the caliph Abd al-Malik ibn Marwān in the course of the first half of the 8th century AD; and the ‘takeover’ of the offices by scribes with Iranian background during the late 8th and early 9th centuries AD. Such an approach of ‘observing the scribe at work’ is significant for the historian of Islamicate societies. Processes of Arabisation and Islamisation, i.e. the migration of social groups, the exchange of administrative personnel in the chanceries, and the phenomenon of religious conversion, become visible that seem otherwise undetectable. These had deep impact on the development of Muslim rule and administration and contributed to the dissemination of a common imperial culture in peripheries of disparate conditions. In this paper I will analyse the crucial role that scribes from the Ptolemaic to the Byzantine periods played in disseminating the philological work of the Alexandrian scholars on Homer in Egypt and beyond. I will review the scribal evidence from the Ptolemaic period to the Byzantine era and show that the format of the Homeric editions changed in the centuries after the work of the Alexandrians: scribes were embracing the innovations introduced by the Alexandrians both in the book layout (divisions into books, end-titles) and in the most technical aspects of Alexandrian philology (variant readings,exegetical comments, critical signs added in the margins). Manuscript evidence thus shows that scribes from the 2nd century BC to the 10th century AD had two distinct and fundamental roles in the Homeric tradition: they preserved the most technical aspects of Alexandrian scholarship and they also disseminated its more popular innovations (like the book division). The activity of the scribes therefore ensured that Alexandrian scholarship did not remain a dry intellectual product locked into the Library with no future, but on the contrary permeated book production and literary discourse in the following centuries, and ultimately informed our own reception of the Homeric texts. One of the problematic aspects of P.Berol. 13270 is the identification of two supposed scribes involved in the text redaction: in 1924 Ulrich Wilcken observed that the text must have been written by two writers and recognized two different kinds of handwriting: one “strong and plain” and the other “slighter and more delicate”; moreover he added that each scribe might have used his own calamos, which also influenced the ductus. This proposal has been largely accepted. Recently, Bendetto Bravo has carefully described the alternation of the supposed two writers, suggesting also a possible change of calamos between the writers. The differences recognized in the handwriting will be examined in order to verify a possible different explanation for the highly problematic presence of two writers. The carbonized papyrus dossier from Petra, metropolis of the Roman province Palaestina Salutaris/Tertia, presents a group of documentary texts all written in Greek in the sixth century AD, and all found from the same small side room in the Church of Virgin Mary. Most of the texts were written in Petra, and some in nearby villages. The documents are mainly contracts, tax receipts, donations, settlements of disputes, etc., all somehow relating to the possessions of an ecclesiastical family belonging to the uppermost stratum of society. They also seem to represent high standard Byzantine Greek language and notarial practices. In this paper, I will collect together all the information on the writers appearing in these documents. These were the notaries (symbolaiografoi), who drew up the lengthy legal texts. Some of them we know by name, some only by their handwriting, spelling and perhaps other linguistic features. The people whose matters the documents dealt with usually signed the contracts themselves or used signatories; the signatures were long because it was necessary to repeat the contents of the contract. The signatures present various levels of literacy. The documents also included short signatures of witnesses. Some less important documents were not written by notaries, but by the people themselves. Now that almost all the texts from the dossier are published or very near to being published, it will be possible to draw conclusions about the writing skills and scribal practices in Petra. "In Scritti in Onore di Orsolina Montevecchi, Bologna 1978, pp. 373-376, I published a note entitled "Was re-rolling a papyrus roll an irksome and time-consuming task ? ", in which I described experiments with rolls cut from rolls of wall-paper, on the basis of which I concluded that re-rolling a roll was much easier and quicker than had been supposed, and that the secret lay in letting the roll do the work of rolling through its natural tendency to roll up. I assumed that a roll of papyrus, having been rolled up at the time of manufacture and kept constantly rolled up except when opened for the purposes of writing and reading, would have possessed the same tendency to roll up, but of course I had no means of proving it. Now the proof has come to light in a surprising way. Among the great find of papyri at Dishna, not far from the better-known Nag Hammadi, were a number of papyrus rolls. The owner of one of these rolls tried to unroll it, but found that the papyrus began to break. He thereupon immersed the roll in warm water, after which he found that he could unroll it without damage either to the roll or the writing. He left it unrolled, and five minutes later the roll had rolled itself up. It is surely remarkable that 1500 years or so after its manufacture a papyrus roll should still retain its capacity to roll itself up and thus completely confirm the results of my experiments." T.C. Skeat, "Roll versus Codex - A New Approach?" Zeitschrift für Papyrologie und Epigraphik 84 (1990): 297. The wall-paper illustration of Skeat is telling - the rolling up happens quickly, which is partly why the metaphor is used by John in the first place. The fifth Lincoln College International Summer School in Greek Palaeography will be held on 28 July-2 August 2014. The school offers a five-day introduction to the study of Greek manuscripts through ten reading classes, four library visits and five thematic lectures. More details here. For a report from an earlier summer school see here. Perhaps it is needless to say that this very prestigious enterprise will be important for the CSNTM and its professional reputation. Hopefully this success can open up many doors in the future so that the scholarly community and everyone interested in New Testament manuscripts can have access to state-of-the-art images of these ancient Christian artefacts and the text they carry. Since I happened to know about this expedition beforehand, I managed with short notice to organize for a student to go along on the expedition for a few days in the summer and study one of the papyri on site for his thesis work. 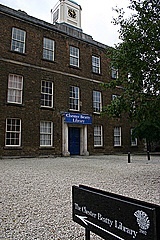 He will do a guest blogpost about his wonderful experiences in the Chester Beatty Library – stay tuned. On the 3rd of September the British Library announced eleven new manuscripts had been digitised and the images placed on-line. For more details on the manuscripts see the CSPMT blog here. A lecture by Professor Nils Arne Pedersen on ‘The Syriac-Manichaean “Allberry fragments”: how they were rediscovered, and what they can tell us’ will be held at 11 am on Saturday 14th September in the Milstein Seminar Rooms at Cambridge University Library. 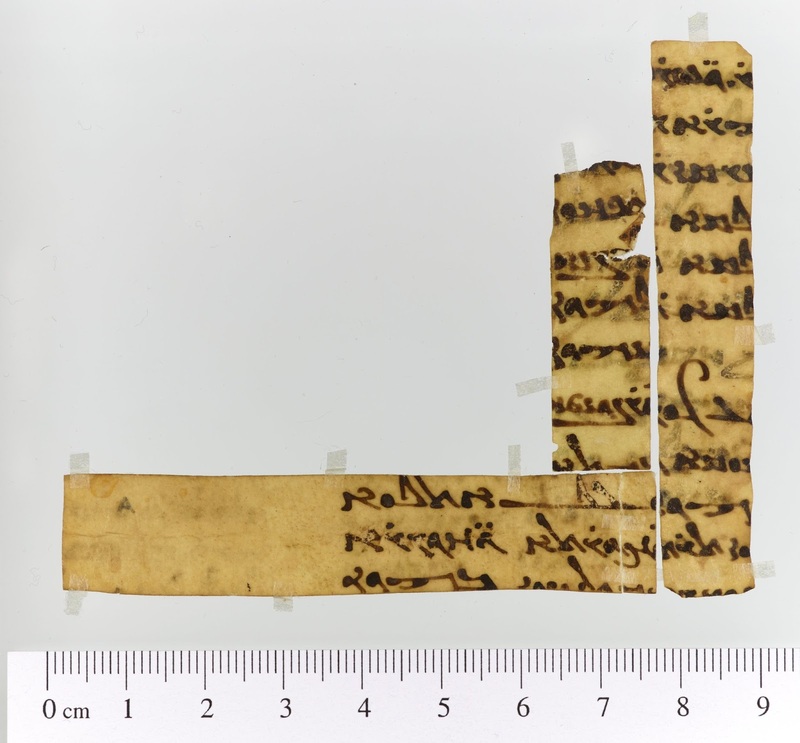 The lecture is to celebrate the Library’s acquisition of a set of small manuscript fragments written on vellum which date from around the 4th century CE and originated in Middle Egypt. 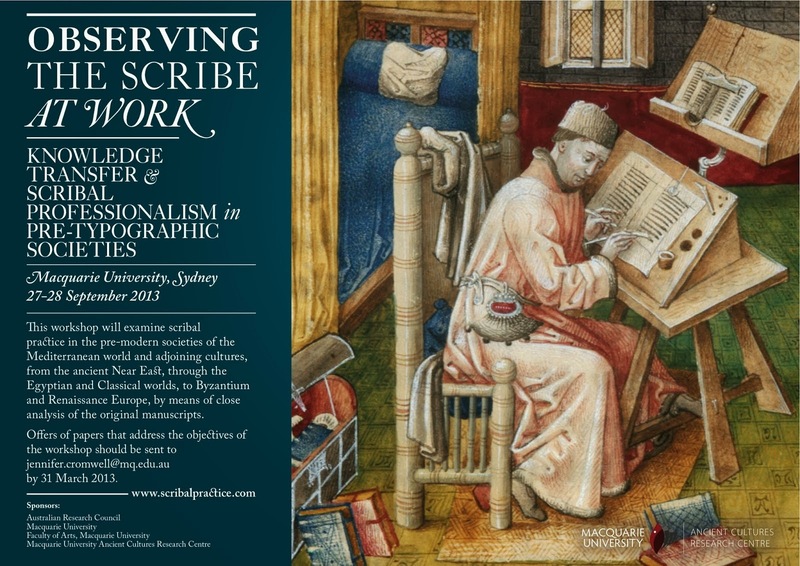 I won't be able to get to this lecture (due to the opening of the under 12s football season in Cambridgeshire); but they look interesting, because in shape and size and provenance they are very similar to some texts of the NT I worked with some years ago (0311, 0312, 0313, 0314, 0315); for more info see my article here (or here) (this image from CSNTM). If there is one occupational hazard that threatens a good number of the text-critical guild, it is that of being pedantic. Squabbling over commas, dots in the margin, spelling, and one another's work (or lack thereof), we have seen it all. Jac Perrin has agreed to share his recently defended thesis "Family 13 in Saint John's Gospel," which we reported on here. The remark by Perrin that we discussed on this blog that "the PA of several other witnesses was in Luke, but their textual content was much closer to the TR than to any F13 member" (p. 277) has been removed since it proved to be wrong. You find the thesis here and in the right sidebar (TC Files for download). Testament Studies 59 (2013), 588-606. 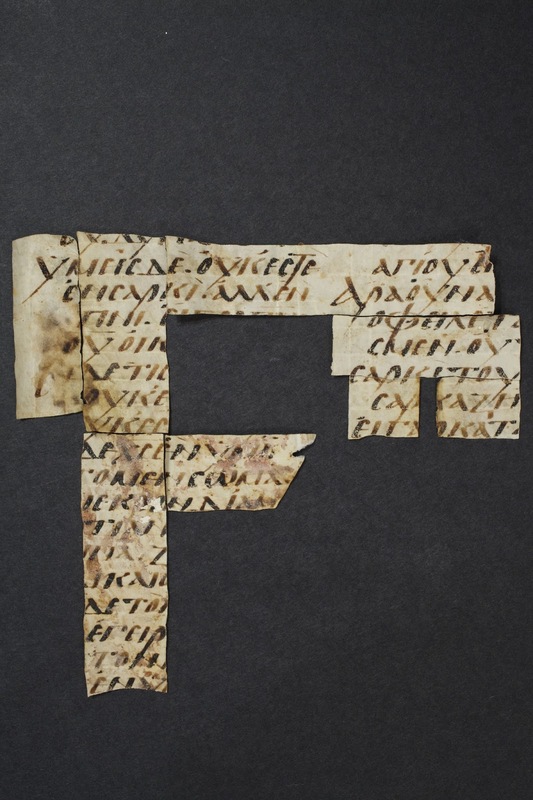 Following the recent emphasis on studying early Christian manuscripts as historical artefacts, whose text and meta-textual aspects comprise important embodiments of reception and interpretation, this article re-examines the early Titus fragment P32 (P.Ryl. Gr. 1.5) with respect to its physical situation within the manuscript. I expand the scope of current reconstructions to consider in detail the lost beginning of the epistle, and argue that Titus was not the first document in the codex: at least one other preceded. Although the identity of the accompanying material cannot be deduced codicologically, patristic evidence suggests that Titus was normally transmitted in a collection of thirteen or fourteen Pauline epistles when the P32 codex was produced, rendering these the prime candidates. Not a trick question: 27. And there is more (that I learnt from Bart Ehrman): this is trinitarian, since the NT is about the Christian God, and therefore specifically about the Trinity. And what is 27? 3 to the 3rd power (3 x 3 x 3). The Bibliographical Society of America has released a helpful Directory of Institutions in the United States and Canada with Pre-1600 Manuscript Holdings (compiled by Melissa Conway and Lisa Fagin Davis). This is about how the bible speaks to itself - or the textual cross-references within it. The bar graph that runs along the bottom represents all of the chapters in the Bible. Books alternate between white and light gray and the length of each bar denotes the number of verses in the chapter. 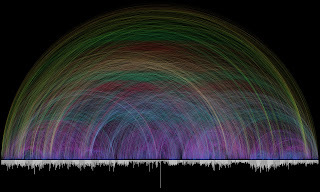 Each of the 63,779 cross references found in the Bible is depicted by a single arc - the color corresponds to the distance between the two chapters, creating a rainbow-like effect. Today, as I received an invitation to join another discussion group for New Testament textual criticism, I was reminded about an old blogpost I wrote here six years ago (how long have I been blogging here? ; the years go by) about the many discussion lists for NT textual criticism, "TC Discussion List Inflation?" This list is still operating and I subscribe to it. There are 742 members. I note that many renowned scholars post here from time to time. However, mostly I don't read the many endless discussions over various topics. This group is still operating and it has 130 members. I am not one of them. This group is also operating (low activity) and has 142 members. You are invited to join the discussion-group NewTestamentTextualCriticism. The Yahoo groups Textualcriticism and TC-Alternate have been rendered difficult to use, thanks to a recent redesign of Yahoo Groups' format. This Google Groups discussion-forum will promote well-organized discussions, as well as the sharing of news (related to the main subject), files, links, and images. James Snapp, Jr. is the moderator of this group. A forum dedicated mainly to the analysis of textual variants in witnesses to the text of the New Testament, with the goals of reconstructing the original text, increasing the confidence of such reconstruction, and tracing the history of the text's transmission. I will not join this group – participation in one discussion group is quite enough for me. Further, I assume that to a large extent there is an overlap so that some folks are members of several such groups.